Happy Birthday to my SIL Judy, I hope you have a fabulous day. 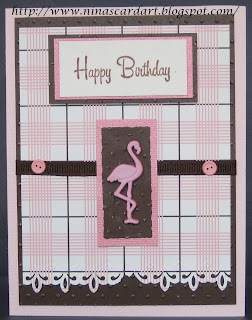 Supplies: Pink cardstock, American Crafts Mother Hubbard Designer Paper, Stampendous – Happy Birthday, Flamingo – Jesse James Button, misc ribbon and brads. 1) Cut the card stock 8.5 by 5.5, fold in half for a 4 ¼ by 5 ½ card. I did not assemble the card until all pieces and bits were all ready and had its place. 2) Cut the next layer from the back side of the designer paper, at a size that fits your likes, I left about ¼ inch of pink border. Run this through Cuttlebug using a Swiss Dots folder. 3) Use a second piece of same designer paper, this time using the front side, again size it to create another small border, use a Fiskars punch to create a border along one side. I used All a Fleur for this card. 4) Cut a length of ribbon and glue it to the top 2 layers. Add the two brads. 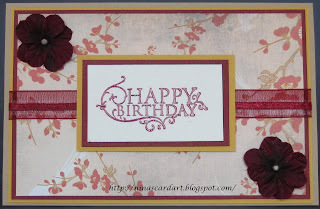 5) Stamp Happy Birthday on watercolor paper (I used Sepia ink for a softer look), size it, then add a couple of layers to add dimension, I used a darker pink card stock and a left over piece from the Cuttlebug embossed sheet. When assembling I used pop dots to lift it up. 6) I cut the plastic button loop off the Flamingo button and glued it to more layered card stock. 7) I glued all the small pieces together, then glued the layers to the card stock and complete assembling the card. 8) I then used left over designer paper and some natural colored cardstock to create the inside of the card. 9) Personalize the back of the card with signature stamp. Some additional steps, I used a Tombo pink marker to outline the designer paper, it had a white core that I did not want to show. I also used a nail file to sand some of the dots on the brown paper to let the white show through. Clear like mud? Questions or concerns… Comments always welcome. Happy Friday, the sun is shining, it going to be a gorgeous day. I always struggle with cards for teenage boys, I figure these darker colors will do the trick. I finished this too late to get the evening sun for the photo, and I was not going to set up my light tent at 10pm, so the shading is a little off but you can still get the idea. Supplies: Brown and mustard cardstock, Designer paper – Memory Stor, Cyclist and Happy Birthday - Microsoft Word, Scenic Route twill ribbon. What do you think of the new look… I love it. My sister Barb has made magic. She is so good to me, I sent her a picture of wallpaper and a swirl brush kit I found and pretty much said ‘ help me’. She did more than help me, she created this beautiful work of art. I am so happy, pleased, ecstatic. I am even going to forgo posting a card today in honor of my artistic sister and her current creation. I think I went through my whole supply of stamps last night looking for a Get Well Soon stamp. I have 1, I am not saying I should have a dozen or anything but maybe more than one. I know I could have printed one off from Microsoft work but…. So enough moaning, this was a quick card. 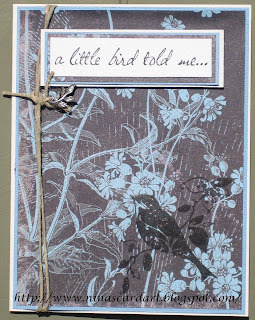 I used my Heartfelt Thanks two-step stamp set from Stampin' Up, with Crimson Cooper and Pearlescent Ivy Dew Drop pigment ink, I stamped the back ground first then the double flower image. Layered it all, added some ribbon and glued it all together. 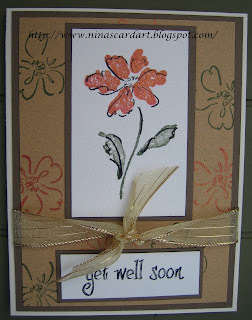 Suppplies: Cream, brown and mustand cardstock, Stampin' Up - Heartfelt thanks, Misc Get Well Soon, Offray Flair Gold ribbon. I thought with all the beautiful sunshine that we had this weekend that I would take the photo of this card outside, it is a little on the bright side but it does display the card nicely. I did not get the chance to make any new cards this weekend, I was busy outside enjoying the gourgeous weather. I do need to start some Father's Day cards though. It is another beautiful day here, I thought I would get a quick post in before heading off for my workout with Survivor Bootcamp. What a great morning for it. I am not going to post steps with this card. I will do a quick outline though as this was a pretty quick card. 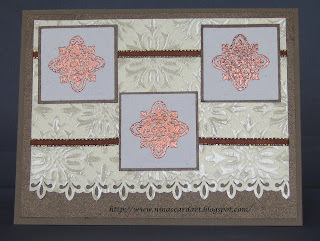 I wanted the focal point of the card to be the swirly Birthday, I am embossed it with a burgundy embossing powder. I used two sizes of ribbon glued together for across the center. The flowers are leftover from a long time ago, they are already put together with brads and pop dots on the back. Supplies: Tan, mustard and burgundy cardstock, Designer Paper from DCWV The Far East Stack, Stamp-is Swirly Birthday, misc ribbon and flowers. This is the resulting card. I started with using just ink to see the result.. Tried a number of inks to try to get a clear image… When these steps failed I think tried using Versamark and embossing powder. Now the fault cannot lay with the stamps alone for the following result. I also find that this particular container of embossing powder does not leave a clean emboss. Anyhoo..
Supplies: Brown cardstock, metallic brown designer paper, embossed glossy paper, Impression Obsession – small ornate quares, Celebrate It Holiday Trim ribbon. This really was suppose to be a simple card so I will do some quick steps. 1) Cut the card stock 8.5 by 5.5, fold in half for a 4 ¼ by 5 ½ card. I did not assemble the card until all the bits were all ready and had its place. 2) Cut a slightly smaller brown metallic paper layer, do the same with embossed glossy paper. I made this for no other reason than to use these stamps. I will not give up on these stamps though, I WILL try again. It is a beautiful sunny day here on the island, warm too - could it be true summer may be on its way? I have been busy busy, and I had to rebuild my computer so although I made some cards I have not been able to post. I think I will try something new, I am going to add some ROUGH steps on how I make my cards. I pretty much fly by the seat of my pants when I make them so this could be interesting. I won't add in all the time I reposition or change my mind. Supplies: The Paper Company – Blond Columns cardstock, green cardstock, BoBunny – Abbey Road Sky – designer paper, Pinkcatstudios – misc flower, Rubber Stampede – Just a note, Offray ribbon – Green. 1) Cut the card stock 8.5 by 5.5, fold in half for a 4 ¼ by 5 ½ card. I did not assemble the card until all pieces were all ready and had its place. 2) Cut the next layer of cardstock to a size that fits you likes, I always like a small border. 3) Cut am additional designer paper layer. 4) Round edges of cardstock and designer paper with a corner punch. 5) Use Spellbinders Large Deckled Mega Rectangles to cut watercolor paper for stamping the flower, cut out a slightly larger green cardstock piece. 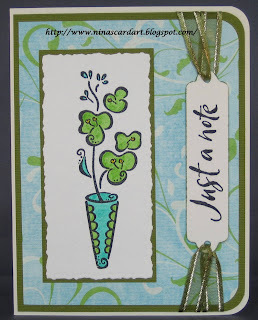 6) Use Spellbinders Double ended Tags for stamping Just a note. I outlined this item with green ink. 9) Glue to Cream cardstock. Personalize the back of the card with signature stamp. Happy Friday, I don't have a card to post. I don't seem to have the energy to be creative :) it is all good though. I have been working my buns off at Survivor Bootcamp at night but I am not as young as I use to be and that truck did not even look back after it hit me (kidding) my body is sore enough to feel like I was hit by a truck. Mind you that is not a complain, as the soreness shows that I am working hard. 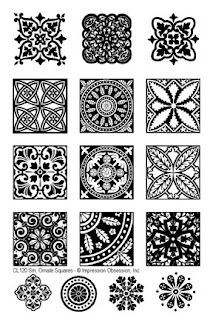 It is a long weekend this weekend and my husband had commitments so there is a good possibility that I will be able to lock myself away in my craft area and play with my stamps... I hear them, they are calling me. I am behind on my cards, I have not been able to surf my favorite blogs in weeks I feel like I am missing out. I can’t see it slowing down anytime soon so I apologize. This card should have been in the mail weeks ago. Supplies: Cream, baby blue and black Bazzill basics cardstock, Embossed Leaves cardstock, Inkadinkado Clear Stamps – Wedding, Offray My Moments – Petite Gems, Misc cream ribbon, Misc black sentiments ribbon. 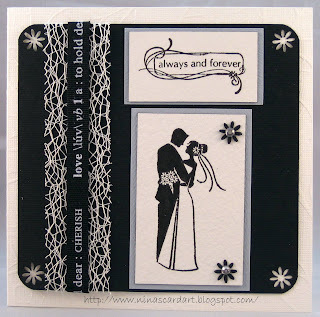 I have been so busy and unfortunately my cardmaking is what does not get the attention. As promised oh say over a week ago is a card portrait of a Birthday card I made for my husband. I struggled to start this card, and I sat down to start it a number of times. When it came down to the wire and I sat down a final time the creativity started to flow. I have a few sheets of Harley Davidson papers in my stockpile, a must really. I layered with greys, black, pewter and designer papers. 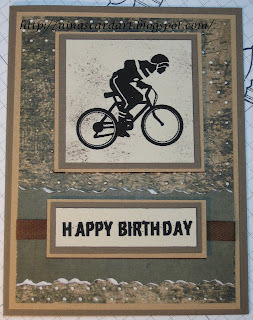 I stamped and embossed the motorcycle and Happy Birthday in Black. I then punch the holes to thread the rawhind strip in a cross pattern along the center accenting with square brads. 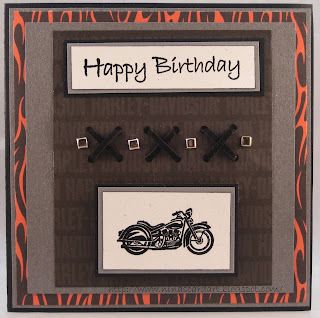 Supplies: Black and pewter cardstock, Ek Success Harley Davidson Orange Flame and Bar Font Repeat designer paper, Inkadinkado- Mod Motorcycle, the Artful Stamper – Happy Birthday, Black rawhide strip, misc black brad . I hope everyone had a fabulous Mother's Day, I was spoiled rotten and had a wonderful day. It is Hubby's birthday today. I have a very nice card I want to post, I forgot to take a picture?? I though I had but I guess not. I don't have time to do it this morning as I have to decorate but I will post it tomorrow. Ha ve a great Friday.